Toronto’s Executive Committee will consider a report from the City Manager at its meeting of May 15, 2017 regarding the preferred alignment for the southern end of the “Relief Line” subway, as well as the current status of the Yonge Subway Extension to Richmond Hill. This report has taken on a more political context with Mayor Tory’s recent statements that unless Queen’s Park coughs up financial support for the RL, he will block any further work on the YSE. Needless to say, this stance did not play well in York Region or at Queen’s Park. One might cast a though back only a few years to Tory’s election campaign in which he claimed that SmartTrack would eliminate the need for a Relief Line, that it would have frequent service with many new stops, that it would operate with TTC fares, and that it would be self-financing. Most of these claims were demonstrably false or impossible at the time, and the project scope has changed dramatically. Even the question of a “TTC fare” is tangled up in the Metrolinx Fare Integration study which could well bring higher rapid transit fares to the TTC as a way of “integrating” them with regional systems. Tory’s convoluted evolution into a Relief Line supporter undermines his credibility on many issues not the least of which is an understanding of when money he demands might actually be spent. There is no point in getting a “commitment” from Queen’s Park when the government will be unrecognizable by the time the bills come due. Toronto has far more pressing demands in the short and medium term, and meanwhile there is $150 million of provincial money going into design work for the RL. As for the YSE, it has been on York Region’s wish list for years, and is more advanced than the Scarborough Subway which is mired in debates about the alignment and number of stations. The problem for Toronto is that there is no capacity for additional riders from an extension on the Yonge line, and indeed it is already over capacity according to a CBC interview with TTC Deputy CEO Chris Upfold on May 10. Yesterday’s launch by York Region of their Yonge Subway Now website brought to the fore the question of just how much room remains on the Yonge Subway for additional riders. Over many years, claims about capabilities of new subway technologies together with changing projections for future demand have left Toronto in a position where its subway is badly overloaded with little relief in sight. This article traces the evolution of those claims and the reality of what can actually be provided to show that building a Relief Line is not a project for a future decade but one that must begin now. Updated July 6, 2016 at 5:10 pm: “Yonge Subway Now” has updated their website to remove the double counting of capacity improvements, and to clarify that their claims about subway capacity apply to the peak point south of Bloor Station. The revised text is included in the main article. Although in theory there will remain 4% of free capacity on Yonge south of Bloor in 2031, this is hardly the sort of margin we should be planning for. The Relief Line’s demand projections show that it has a major effect if it runs north to Sheppard, and it will have to be in place sooner rather than later to avoid deadlock on the Yonge line. A related problem is the question of station capacity to handle passengers with trains arriving about 30% more frequently than they do today. York Region has wanted a subway to Richmond Hill for years, and there is even a completed Environmental Assessment and its Addendum for this project. Today, July 5, 2016, a new website extolling the virtues of this project went live. It contains the usual things one would expect about the growing need for transportation and how a subway will improve the region’s future. Unfortunately, it also contains a misrepresentation of available and future subway capacity. But what about overcrowding you say? Regional Express Rail/SmartTrack/DRL will add even more capacity. With the above capacity improvements in place the Yonge Subway line will be running under capacity when it opens and beyond 2031. 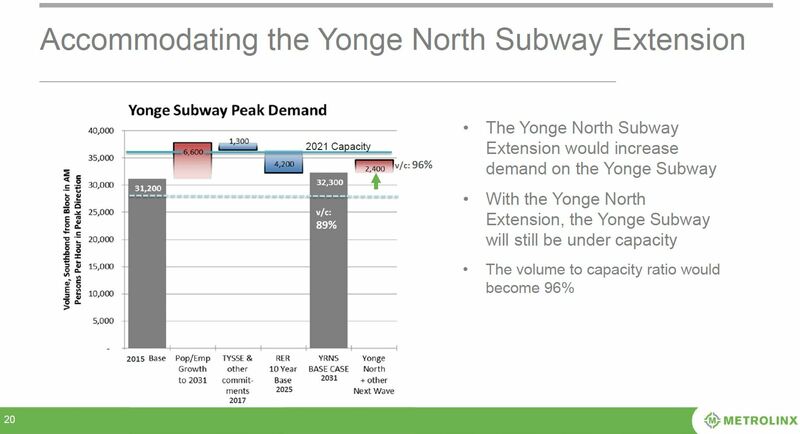 The Yonge North Subway Extension only adds 9% demand at peak period. Regional Express Rail diverts 4,200 riders to free up 15% capacity. With the above transit improvements in place the Yonge Subway line will be running under capacity when the extension opens in 2031. The Yonge North Subway Extension has a projected ridership of 14,000 to 22,000, but is only expected to add 2,400 demand during the AM peak hour, at the peak point south of Bloor. Let’s start off with the increased capacity for the Yonge Subway. The Metrolinx report cited here says (p 15) that the existing capacity is 28,000 passengers per hour per direction, and that by 2021 this will rise to 36,000. That’s roughly a 29% increase, and is possible because of the new signal system which includes automatic train control. This will allow trains to run closer together, roughly every 110 seconds in place of the current 140 seconds. Capacity of the new subway cars is already included in the 28k value as these trains have been exclusively providing service on the Yonge line for a few years. They no longer represent a marginal improvement that is still available. The design load for service planning (average loads over an hour, not peak loads on a train or car) for the new trains is 1,100 passengers. If trains run every 140 seconds, that is equivalent to 25.7 per hour or a capacity of about 28k/hour. Moving to a 110 second headway gives 32.7 trains/hour or a capacity of 36k/hour. Traffic diverted to the TYSSE (Toronto York Spadina Subway Extension) at 5% of current capacity represents 1,400 per hour. 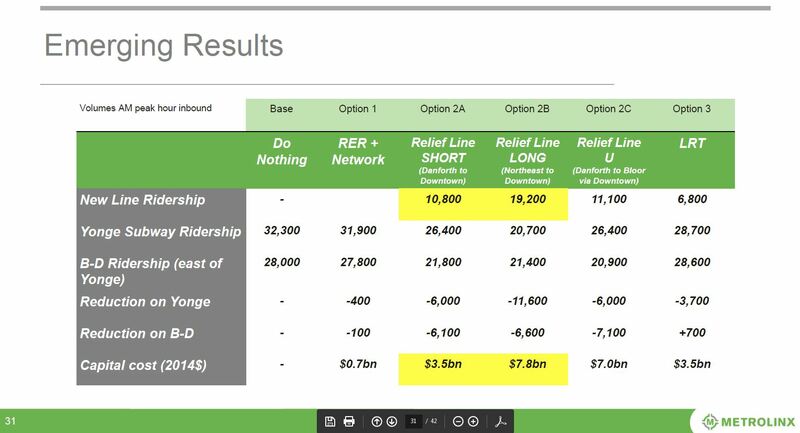 This is in line with the value shown in the Metrolinx study (see chart below). GO/RER has only a modest effect on the Yonge corridor because the Richmond Hill line is not part of the RER network, and other routes paralleling Yonge (the Barrie and Stouffville corridors) are too far away to have a meaningful impact. There is also the issue of the fare differential between GO/RER and the TTC which could discourage some riders from travelling on GO. SmartTrack was originally claimed to be capable of subway-like service down to a 5 minute headway (12 trains/hour) that would serve Unionville and Milliken stations. However, we now know that “SmartTrack” will really be just a few more GO trains (part of the already planned RER improvement) stopping at a few more stations within Toronto, not the “subway like” operation some in York Region might have expected. The Metrolinx study includes a chart showing the interaction of demand and capacity changes to 2031. The current 2015 demand is shown as higher than the actual capacity (31.2k vs 28.0k) based on the level of overcrowding now experienced on the line. The light blue dotted line shows the capacity before the new signal system is activated, and the solid blue line shows the added capacity. Even this will not be sufficient to handle the projected growth to 2031 absent other changes. The TYSSE and other changes are expected to shift 1,300 per hour from the Yonge line, and a further 4,200 would be attracted by GO/RER. This mostly, but not completely, offsets the anticipated growth so that by 2031 the “base case” demand is 32.3k, slightly higher than the demand today, but in less crowded conditions thanks to more trains/hour. The Yonge North extension adds only 2,400 peak hour passengers and brings the line up to 96% capacity. Note that this is the peak hour average, and there will be some overcrowding due to variations over the hour. This leaves no room for growth, but it also shows the paltry additional demand expected on a very expensive subway extension. Indeed, this makes the Scarborough extension to STC positively shine by comparison with 7,300 peak hour riders. The projected demand on the Richmond Hill line appears to be lower than the existing ridership of the SRT! But things are really not that bad. Those 2,400 are net new riders attracted by the subway in place of existing bus service. Total ridership will be a combination of then-current bus passengers feeding into Finch Station plus the 2,400 new riders. Metrolinx shows that the “long” version of the Relief Line to Sheppard produces a sizeable reduction in projected demand on both the Yonge line and for the Bloor-Yonge transfer movements. If Metrolinx, Toronto and York Region are really serious about providing capacity for future extension and ridership growth on the Yonge Subway, then construction of a Relief Line is absolutely essential despite its cost. Meanwhile, York Region should update its website to provide accurate claims about future changes to subway capacity. Blatant inaccuracy such as we see here are the marks of hucksterism designed to sell a project, not a professional representation of what is actually needed. Update: The new version of the website addresses these issues, but I must wonder why the incorrect information appeared there in the first place. Today saw an exchange in the Ontario Legislature showing the true colours of the provincial government when it comes to an informed, intelligent discussion of fare integration in the GTHA. The full exchange is below lest anyone accuse me of quoting them out of context. Ms. Andrea Horwath: My question is for the Acting Premier. Throughout its history, TTC fares in Toronto have been based on the simple principle that every Torontonian deserves equal access to their transit system regardless of their income and regardless of where they live. But now Metrolinx is quietly working on a fare integration plan that could force people living in Scarborough, Etobicoke and North York to pay a higher fare for a subway ride than people living downtown. Will the Liberal government guarantee that Metrolinx will not force people living in Scarborough to pay more to ride the subway? Hon. Charles Sousa: Minister of Transportation. Hon. Steven Del Duca: I want to thank the leader of the NDP for the question. Of course, as everyone should know by now, the folks at Metrolinx, who are doing an exceptional job, are working hard to liaise with all of our municipal transit systems around the greater Toronto and Hamilton area to make sure that, collectively, we can deliver on fare integration for this region. I think anyone who moves around the greater Toronto and Hamilton area would recognize—and certainly I hear it loud and clear from my own constituents in York region—that we need to make sure, in order to support the unprecedented transit investments that this government is making, that we need a fare integration system across this entire region that works seamlessly, that makes transit more accessible, more affordable, more reliable and more dependable for the people of the entire region. That’s the work that Metrolinx is embarking upon in conjunction with all of our municipal transit systems. They will keep working hard, Speaker, to make sure that we can get it right. Ms. Andrea Horwath: Speaker, in fact, what Metrolinx has been quietly doing is designing a fare integration plan that could force the TTC to become a zone-based system that divides Torontonians based on where they live. So years from now, people in Scarborough might get a new subway but then find out that they can only afford to ride the bus. Will the Liberal government guarantee that there will be no fare zones within Toronto, and that Metrolinx will not force the TTC to charge higher fares for subway riders? Hon. Steven Del Duca: I guess only the leader of Ontario’s NDP would think somehow that after months of open conversations, after months in which every single board meeting has a public portion, only the leader of Ontario’s NDP would think that this is somehow hidden. It’s a conversation that’s been ongoing. It’s part of my mandate letter which, of course, she should know. For the first time in Ontario’s history our mandate letters were posted publicly at the time that we received them, Speaker. I think what’s also, perhaps, the reason that the leader of the NDP is mistaken about how supposedly hidden this effort is, Speaker, is that because while we are investing in transit through budget after budget after budget, that leader and the NDP caucus continue to vote against them. They are obviously more focused on petty partisan politics in Scarborough instead of being focused on making sure that they support the transit investments needed to deliver the seamless integrated transit network the people of this region and the people of Scarborough deserve. Let’s get the historical inaccuracy in Horwath’s question out of the way first. The pre-Metro Toronto Transportation Commission used a single fare within the old City of Toronto, and supplementary fares beyond in what were then separate municipalities where the TTC provided some services. Some suburban bus routes were operated by private companies which charged their own fares. After the creation of Metro in 1954, the Toronto Transit Commission had fare zones roughly based on the old city and everything else, but these were abandoned in 1973 as part of the political deal for suburban municipalities helping to finance transit expansion through their Metro taxes. I am no fan of Andrea Horwath, but she asks a legitimate question. The Minister’s response is pure political hot air talking about the wonderful work at Metrolinx, and the wonderful spending on transit construction now underway, but utterly avoiding the issue of separate fares either for zones or classes of service within Toronto. Instead, he turns the question into one of “petty partisan politics” and fails to address the matter of whether Scarborough riders will pay more to ride their new subway whenever it opens. One might ask the same question about the Minister’s constituents in York Region who will be heavily subsidized by Toronto Taxpayers to ride the Spadina extension to Vaughan. At its board meeting on June 25, 2015, Metrolinx will consider an update on the study of capacity relief for the Yonge Street Corridor in Toronto. 1.b. 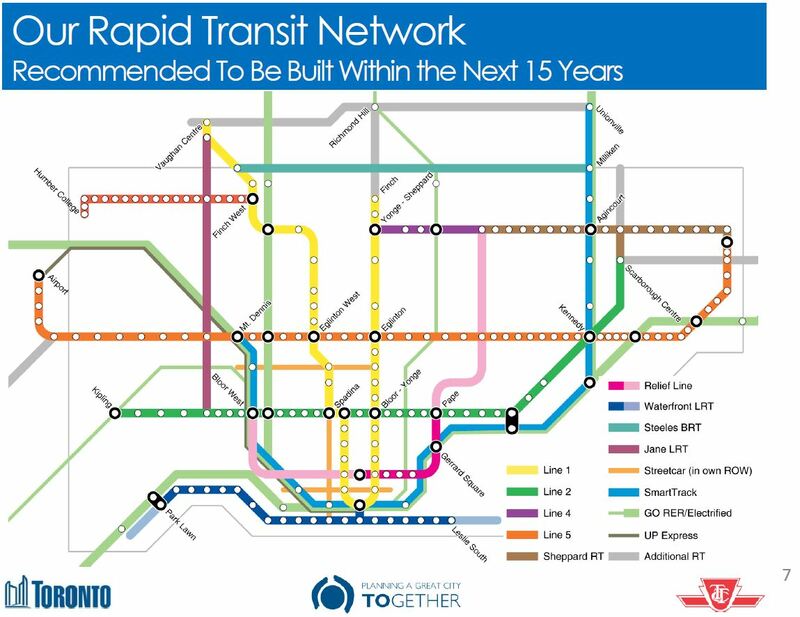 Based on [the] above, more rapid transit service and capacity that is currently funded and being implemented will meet the future 15 year demand, assuming current forecasts on the growth rate of downtown employment and the implementation of TTC automatic train control on the Yonge Subway. 3. Direct staff to work in consultation with York Region, City of Toronto and the TTC to advance the project development of the Yonge North Subway Extension to 15% preliminary design and engineering. 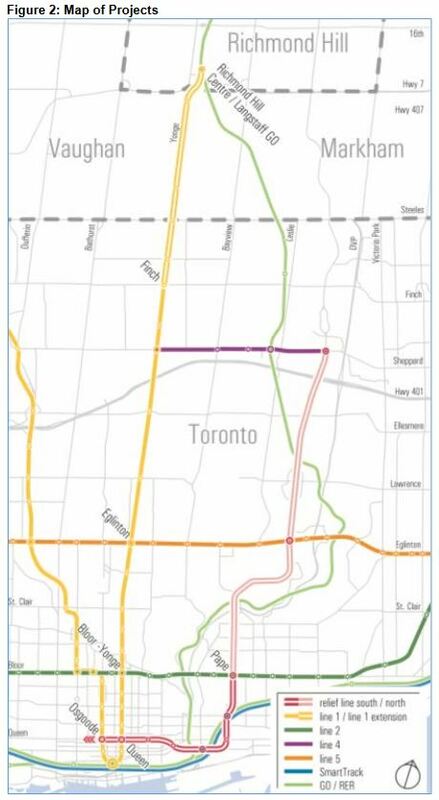 The emergence of a variation on the Relief Line that would operate north to Sheppard is quite a change from days when even getting discussion of a line north of Eglinton was a challenge. The context for this emerges by looking at the alternatives for “relief” that were considered and how they performed. The next report to the Metrolinx Board will be in Spring 2016. The challenge will be to keep planning for a Relief Line “on track” in the face of the excitement and political pressures for GO RER, SmartTrack and a Richmond Hill Subway. The Toronto Transit Commission has entered into an agreement with Bechtel Canada Co. for project management of the Toronto-York Spadina Subway Extension (TYSSE) for up to $80 million. The contract value to Bechtel is based on staffing costs, management fees and incentives to open the subway extension by Dec. 31, 2017. Bechtel staff begin work today and will form an integrated team with existing TTC personnel. The Bechtel contract will expire March 31, 2018. Bechtel’s project director will report directly to TTC CEO Andy Byford. On March 26, the TTC board approved a report from staff that recommended TTC enter into a sole source agreement with a project manager with a proven track record of delivering similar-sized projects on time, and with experience working with multiple contractors, in order to have the TYSSE in service by Dec. 31, 2017. Toronto City Council subsequently authorized the expenditure of $90 million, while the Regional Municipality of York authorized the expenditure of $60 million, for a total of $150 million (third party contractor, plus in-house project costs), to fully deliver TYSSE by the end of 2017. The release is silent on the issue of what might be done with the remaining $70m of Toronto/York’s $160m authorization. In a previous article, I reviewed information from a media briefing by Andy Byford on the status of the Toronto York Spadina Subway Extension (TYSSE) project. At the TTC Board meeting on March 26, 2015, further information was made public both in Byford’s presentation, and in additional material appended to his report. Updated March 30, 2015 at 1:30 pm: The slides from Byford’s presentation are now available starting at page 58 of the linked pdf. Updated March 30, 2015 at 11:30 pm: A new report from the Toronto City Manager to Council advises that the interest earnings on the “Move Ontario Trust” (the repository for provincial contributions to the TYSSE project) have not achieved the target rate of 4% resulting in an $85m shortfall. Oliver Moore reports in the Globe that Ontario has refused to make up this amount as per the original agreement between the funding partners. Toronto and York Region are on the hook for this additional cost estimated at $51m for Toronto and $34m for York Region. This expense is over and above the cost overruns on various contracts, but at least Council cannot blame the TTC because the trust fund is not under TTC control. Appendix F (beginning at page 33 of the linked PDF), is a presentation given to the Executive Task Force who oversee the project on behalf of the sponsoring governments on July 28, 2014. The presentation was given by Parsons Brinkerhoff who had been retained by the TTC to review the project. Appendix G (beginning at page 56) is a two-page summary of Bechtel’s work reviewing PB’s original study and a subsequent APTA (American Public Transit Association) peer review. APTA concluded that an earlier completion date would be possible than PB had projected, but only with major changes to the project management structure. Bechtel concurred in these findings. It is abundantly clear from this material that the TYSSE’s problems were known at the top level of the project in mid-2014 at the latest. At the time, their severity was so great that the project would still be incomplete by the time of the next municipal and provincial election cycles, and that considerable additional cost could be facing the funding partners. This very serious issue did not arise in public discussion until six months later, notably after Toronto’s 2015 budget cycle was complete.